Whenever there’s an emotional involvement with subjects we depict via painting, it’s best to turn towards things you know well and love deeply. It makes our work far more believable and detailed, plus it enables us to enjoy ourselves while painting, which is also very important. The same applies for the young artist Che Smith – she paints the world she knows, the places she’s seen and people she spends time with every day. In her particular case, it’s the rock ‘n’ roll scene of California’s goth and metal subcultures. 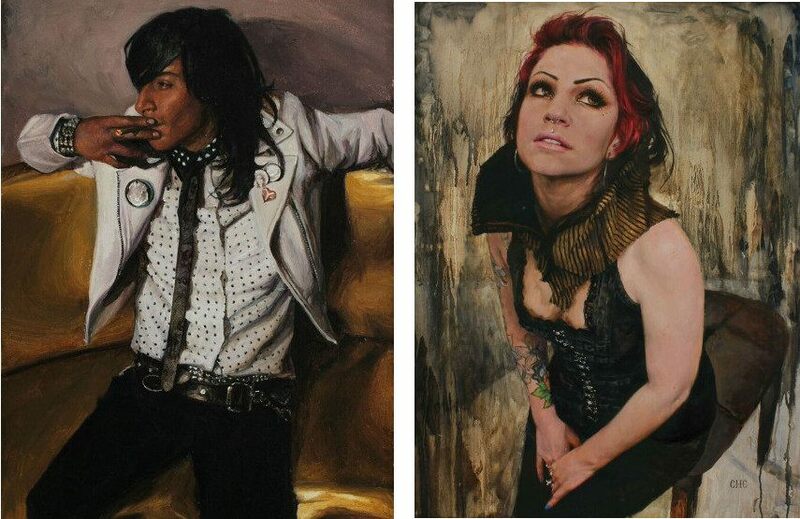 Smith does oil paintings of her fellow rockers and while doing this she also brings the popularity of her alternative culture up. Che Smith is a young painter from Oakland, California. As did most of us, Smith started drawing and painting at a young age, while still a toddler. Her parents were very supportive and helped Che develop her creative side as much as possible. Somewhere on the course of her life, she fell in love with the ideas of rock and punk subcultures and it has been fueling her art ever since. She is also fond of all the accessories that gothic way of life brought with it – all the make-up and characteristic clothing, revolutionary way of thinking, hard metal music and the color black. She then took all of those aspects and channeled them into her characteristic painting style. Che originally learned about art in Atlanta, in the Savannah College of Art and Design. It is here Smith got her BFA and was taught how to oil paint. Through classes, she met the works of Gustave Courbet, Goya, Albrecht Durer and Velazquez, all of whom have heavily influenced her own art. Smith tried hard to figure out how they pulled off their techniques and through this learned a lot about different methods of painting. Che started working shortly after graduating and quickly got herself into figurative painting. She went down that creative path because she realized her inspiration was at its strongest when painting like-minded individuals – people that Che finds awesome, as the artist simply and shortly explained herself. 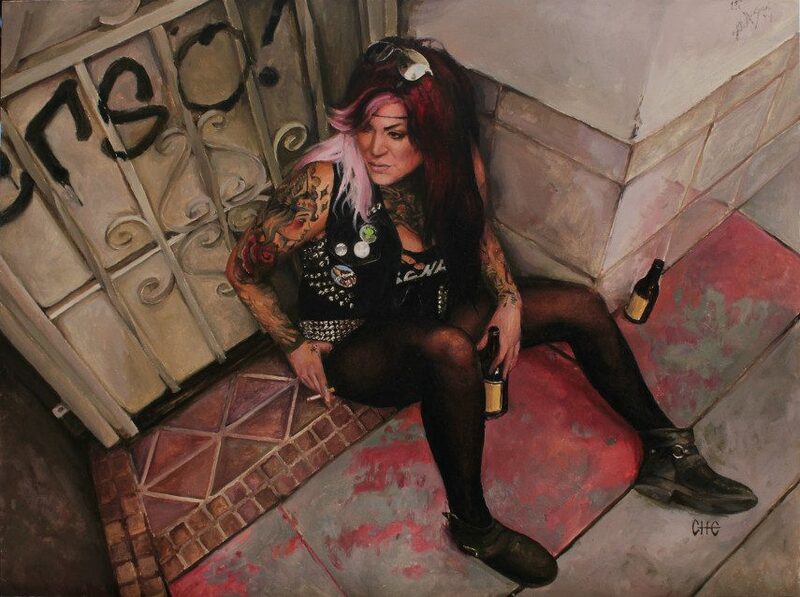 There is something very realistic and raw about the paintings Smith does. She is not only able to depict them perfectly, Che knows how to capture that inner struggle of her subjects, too. There is simply something emanating from her work, a strong sense of the painted person’s essence or aura – their soul if you will. Observing her work is a very personal experience because you feel like you know these people yourself. Her iconic style resonates throughout, making it easily recognizable while simultaneously presenting works that are completely original. As was mentioned before, Che predominantly works in oils on canvases. Since all of her subjects are some kind of children of the night, the sons and daughters of goth, Che’s paintings are ironically very positive and bright – despite the obvious dominance of the black color and the dark motif. They are simply full of life, depicting young people who’ve been lucky enough to find things that fulfill and make them happy. In a sense, Che’s work is a celebration of this new-found paradise young people of California built for themselves. That aside, it should be noted that Smith’s art is simply beautiful to view even if you do not care about her subcultures. Make no mistake, she is one talented artist. Her compositions, perspectives, colorations, forms – it’s all been brought to a masterful level. Smith has received various awards and scholarships, including the Gene Alcott Scholarship, the Georgia HOPE Scholarship, the Governor’s Honors Program, and academic and portfolio scholarships from Savannah College of Art and Design – where she worked as a technician on several occasions. Back in the 70s, when the gothic movement originated in the streets of England, no one could imagine just how strong an impact these weirdly dressed chldren were about to have. What started as a light rebellion against the Mods and Skinheads turned into a real phenomenon of the modern culture. And now, forty plus years after the first metal kids, their way of life continues to evolve and change. And Che is right there to witness it all. 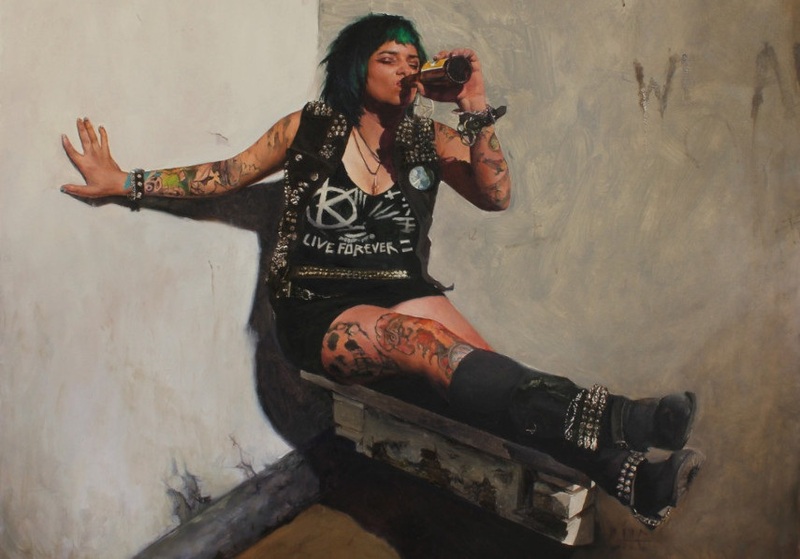 Her restless spirit forces her to move about once per year, so she documents the entire rock scene of California singlehandedly– and she does so by painting punks and rockers in a way that was once only reserved for royalty. Oh, the sweet irony. The artist is represented by Abend Gallery in Denver, US. Che Smith lives and works in Los Angeles, California (US).